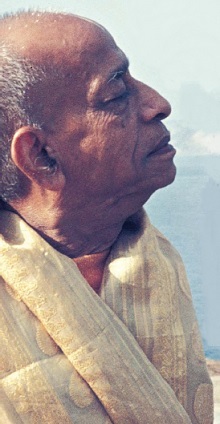 The following conversation between His Divine Grace A.C. Bhaktivedanta Swami Prabhupada and some of his disciples took place on an early morning walk in Geneva on June 6, 1974. Srila Prabhupada: Just look at this fig. In this one fig, you find thousands of seeds, and each tiny seed can produce another tree as big as the original fig tree. Inside each little seed is a whole new fig tree. Now, where is that chemist who can do such a thing: first, make a tree, and next, make the fruit produce seeds – and finally, make the seeds produce still more trees? Just tell me. Where is that chemist? Disciple: They talk very proudly, Srila Prabhupada, but none of these chemists and such can do any of these things. If a man makes an artificial imitation of nature, say by barking, people go to see and even pay money. When it comes to the natural barking, no one cares. And when these big socalled scientific rascals claim they can manufacture life, people give all sorts of praise and awards. As for God’s perfect, natural process – millions and millions of beings born at each moment – no one cares. People don’t give God’s process very much credit. The fool who concocts some utopian scheme for creating living beings from dead material chemicals – he is given all credit, you see: the Nobel Prize. “Oh, here is a creative genius.” And nature is injecting millions and millions of souls into material bodies at every moment – the arrangement of God – and no one cares. This is rascaldom. Even if we suppose you could manufacture a man or animal in your laboratory, what would be your credit? After all, a single man or animal created by you, and millions and millions created by the Lord. So we want to give credit to Krishna, who is really creating all these living beings we see every day. Disciple: Prabhupada, you remember Aldous Huxley, who predicted in Brave New World a process of genetically screening babies, of breeding men for certain traits. The idea would be to take one strain of traits and breed a class of working men, take another strain of traits and breed a class of administrators, and take still another strain of traits and breed a class of cultured advisors and scholars. Srila Prabhupada: Once again, that is already present in God’s natural arrangement. Guna-karma-vibhagasah: according to one’s qualities and activities in his past life, in this present life he gets a fitting body. If one has cultivated the qualities and activities of ignorance, he gets an ignorant body and must live by manual labor. If one has cultivated the qualities and activities of striving passion, he gets a passionate body and must live by taking charge of others – administration. If one has cultivated the qualities and activities of enlightenment, he gets an enlightened body and must live by enlightening and advising others. So you see, God has already made such a perfect arrangement. Every soul receives the body he desires and deserves, and the social order receives citizens with required traits. Not that you have to “breed” these traits. By His natural arrangement, the Lord equips particular souls with particular kinds of bodies. Why even try imitating what God and nature already do perfectly? I told that scientist who visited me, “You scientists – you are simply wasting time.” Childish. They are just imitating the dog’s barking. The scientist pays no attention, gives no credit to the real dog doing the real barking. Actually, that is today’s situation. When the natural dog barks, that is not science. When the artificial, imitation dog barks, that is science. Isn’t it so? To whatever degree the scientist succeeds in artificially imitating what the Lord’s natural arrangement is already doing – that is science. Srila Prabhupada: Yes. Nature is already doing everything with utter perfection. But some puffed-up scientist will make a shabby imitation – using the ingredients nature supplies – and get the Nobel Prize. And what to speak of actually creating a baby – let us see the scientists produce even one blade of grass in their proud laboratories. Disciple: They should give the Lord and Mother Nature the Nobel Prize. Disciple: Really, I think they should give you the Nobel Prize. You’ve taken so many foolish atheists and created devotees of God. Srila Prabhupada: Oh, I – I am a “natural dog,” so they’ll not give me any prize. [Laughs.] They will award the prize to the artificial dogs.